The first edition of Acting Power was a groundbreaking work of acting theory which applied sociological and psychological principles to actor training. The book went on to influence a generation of theatre and performance studies students and academics, and was translated into five languages. Robert Cohen received his Doctor of Fine Arts from Yale School of Drama in 1965, and almost immediately became the founding Chair of the UCI Drama Department. Now in his 48th year on the faculty, he now holds the title of Claire Trevor Professor. As well as teaching acting at UCI, Cohen has conducted workshops in over a dozen countries spanning four continents. In 1999 he was presented with the Career Achievement Award from the Association of Theatre in Higher Education. He is also a director, translator, critic and playwright; and has directed more than a dozen professional productions at the Utah and Colorado Shakespeare Festivals. 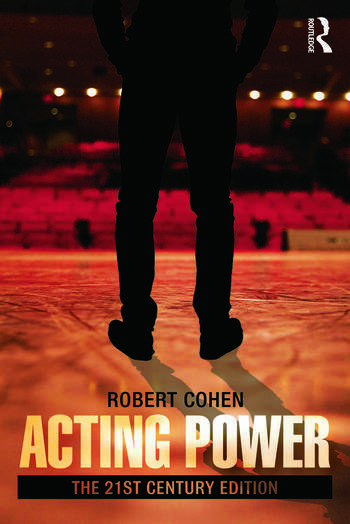 After writing the ground-breaking book Acting Power in 1978, Cohen also authored the leading US acting textbooks Acting One/Acting Two and one of the leading world theatre history textbooks Theatre. Other books by Cohen include leading texts on acting, directing and theatrical collaboration, as well as a collection of published theatre essays and two drama anthologies. Such is Cohen’s influence on the field; UCI presented him with their highest honour, the UCI Medal, and the campus now has a theatre named after him.